We are pleased to announce that Think-a-lot Toys has been licensed to Continuum Games. Orders and inquiries will be directed to them. 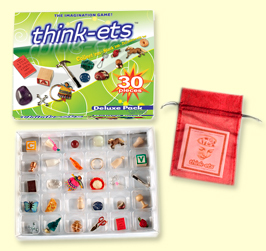 The delightful “tiny trinket game of imaginative play”! Great for family play and on-the-go fun. 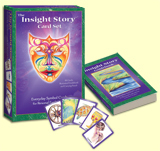 Think-ets is an amazing little travel game for creative storytelling and many other easy-to-learn games. 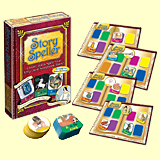 Take 15 tiny treasures from all over the world and use them 10 different ways, including for hilarious storytelling, mind-bending memory games and even a challenging strategy game. Think-ets is ideal for home, restaurants, waiting rooms or pool-sides. Collect all four different color pouches since each pouch has a different set of trinkets. It’s Party-time! 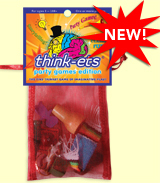 The latest Think-ets game from Think-a-lot Toys is like having a “party-in-a-pouch”. This edition of our award-winning Think-ets game is geared for adults, teens and college kids who want their own, slightly more sophisticated version of the game. Well, some might call it sophisticated to play the game at a picnic, a bar, or a houseboat and get silly with stories, throw objects into glasses, or try to come up with categories, rhymes and names in speedy fashion. 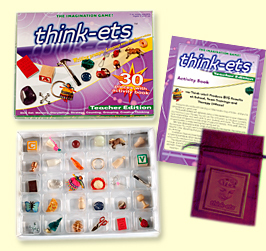 The delightful “tiny trinket game of imaginative play” with a theme! Think-ets Collections are for beach lovers and sports fans. 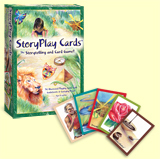 Kids will love the cool, themed trinkets and will want to tell lots of great stories. Each game has 15 miniature trinkets from around the world and the same instruction booklet as Think-ets Original, with 10 different games to play, all housed in an ocean blue (Beach) or orange (Sports) mesh pouch. 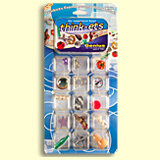 Now kids can have their own Think-ets game with atheir favorite themes including winter Holiday Think-ets and Easter Think-ets (available seasonally)! The challenging, multi-purpose imagination game in a tin! Take your creative skills to the next level. 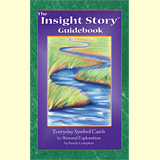 The expanded version of Think-ets for larger stories and larger imaginations! Copyright © 2010 Think-A-Lot Toys. All Rights Reserved.